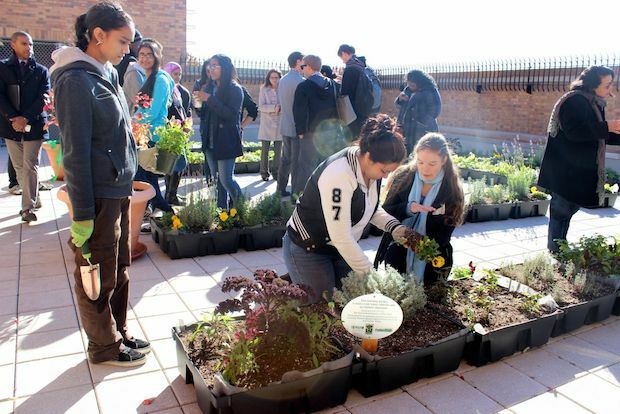 ASTORIA — An unused rooftop terrace at William Cullen Bryant High School was transformed Monday into a garden blooming with lavender, basil and mint, teaching students about ecology and farming. The new green space, installed by the Horticultural Society of New York, was designed and planted by students in the school's Global Kids program as part of a campaign focused on urban gardens and their environmental benefits. "Kids basically spent the entire summer learning more about not just why green roofs are beneficial but how they actually work and how they're constructed," said Global Kids staffer Devon Mercurius, who said the group took trips to local rooftop farms, including Brooklyn Grange. The new garden features 57 green-roof modules filled with herbs, vegetables, perennial shrubs and colorful flowers. "Most of the plants that were planted here are edible — a good majority of them are herbs," said Pamela Ito, director of children's education for the Horticultural Society. "We also have lettuce which we can harvest in a couple of weeks, and we have things that are going to attract bees to pollinate the flowers and the plants," she added, saying the space will be used as a learning garden incorporated into some of the school's classes. The garden was funded with a grant from the North Star Fund's Greening Western Queens Fund, and is one of six established in the neighborhood. Other local schools with learning gardens include Aviation High School, P.S. 12, P.S. 150, P.S. 151 and I.S. 141.